New York-based real estate developer, Pan Am Equities, is still seeking to force an enormous high-end residential/mixed-use development at 2750-2800 W. Casitas Avenue. 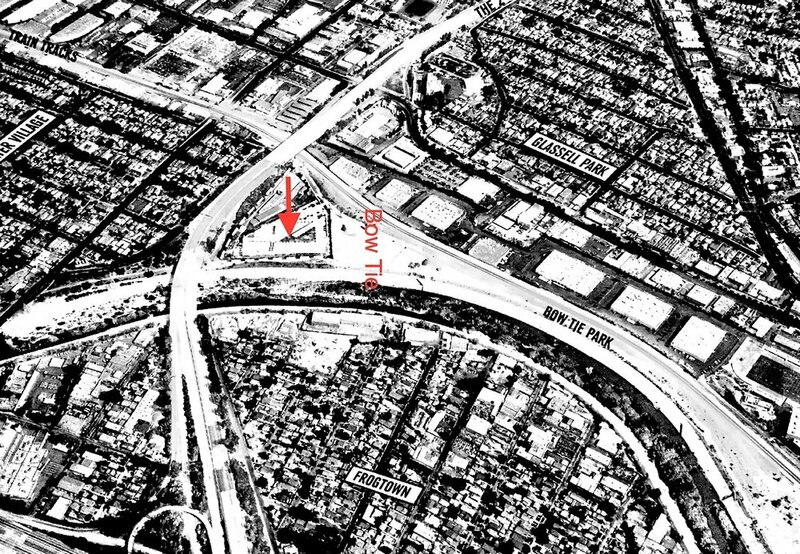 The 5.7-acre site is located at the terminus of Casitas Ave in South Atwater Village. The Los Angeles River is adjacent to the site’s southern boundary line, and the Glendale Freeway is located to the north-west. There is only one entrance/exit to the location, on Casitas Ave under the Glendale Freeway. Dubbed the “Bow Tie Yard Lofts” the project consists of five buildings with a total of 419 multi-family residential units (approximately 423,872 square feet) and about 64,000 square feet of commercial space. The existing zoning and use for the site include a light manufacturing/ warehouse/film production building and its associated surface parking. The project would demolish the light industrial buildings and eliminate all existing manufacturing jobs at the site. The proposed residential units would include a combination of 119 studios, 220 one-bedroom, and 80 two-bedroom units in four buildings ranging from five to six stories (60 to 81 feet tall). Only 35 units would be reserved as “affordable.” Commercial uses on-site may include a mix of restaurant uses and office space and seven-story (85 feet tall) parking garage on the northwest end of the property would provide 720 on-site parking spaces. Open space areas and recreational amenities would be limited to just 58,176 square feet. This gargantuan project is also seeking gigantic exemptions from the City’s land use laws. Pan Am Equities has already requested a General Plan Amendment to the Northeast Los Angeles Community Plan to change the land use designation of the property to allow for residential units. They are also seeking a Conditional Use Permit to allow a density bonus (108 more units) greater than what is allowed by law. The developer is hosting a community meeting to discuss the project. Locals are strongly encouraged to attend.